Mark Hornsby, Sweetwater Studios Senior Producer/Engineer, will lead the hands-on session from January 31 – February 2. Sweetwater Studios, the world-class, multi-room recording facility owned and operated by top music retailer Sweetwater, will host another installment of its three-day, hands-on recording master classes this month, featuring the progressive rock supergroup Frost* with Sweetwater’s Nick D’Virgilio. The class will be led by Sweetwater Studios’ Mark Hornsby and will take place January 31 - February 2. The master class is open to registered students on a first come, first served basis. The master class is to be held in Sweetwater Studio’s Studio A, and will focus on three primary elements: Learning Pro Recording Techniques, Recording Overdubs and Editing Tracks, and Mixing Tracks. While members of progressive rock band Frost* perform complex arrangements, award-winning producer engineer Mark Hornsby will delve into the intricacies of tracking, editing, mixing and more. Comprised of Jem Godfrey (keys and vocals), John Mitchell (guitar — It Bites, Kino), Nathan King (bass — Level 42, It Bites), and Craig Blundell (drums — Steven Wilson, Steve Hackett), Frost* is a 21st-century prog rock phenomenon. With the release of their debut album Milliontown in 2006, Frost* began to make uncompromising waves in the U.K. prog rock scene and have continued to challenge the concepts of what prog rock is ever since. Following up in 2008 with Experiments In Mass Appeal, Frost* ditched the keyboard-heavy sound of Milliontown and won a new army of fans among the college rock stations of the U.S., culminating in support shows with Spock’s Beard and Dream Theater. Due to continuing tour commitments with Steven Wilson, Craig Blundell cannot make this workshop, so Frost* have reconnected with Nick D’Virgilio. Nick is no stranger to Frost*. Back in 2009, Nick joined the band at the Rites of Spring festival, and out of that show came the double live CD, The Philadelphia Experiment. In May 2015, Godfrey announced that a new Frost* album was in progress. Falling Satellites was released on May 27, 2016 to critical acclaim. With a healthy disregard for the prog rock rulebook, the band continues to take risks and push boundaries within the genre, regardless of the consequences. 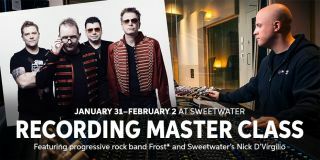 For more information, head over to sweetwaterstudios.com/event/frost-recording-master-class.